Many guys love sports. Playing sports. Recalling the “glory days” of past athletic achievements. Rooting for sports teams. Talking about sports…endlessly. So when you ask a man to list some of his favorite movies, he’s likely to name a few sports films. Whether the sport is football (Rudy, Remember the Titans), baseball (Field of Dreams, Moneyball), basketball (Hoosiers, Glory Road), boxing (Rocky, Raging Bull), running (Chariots of Fire, McFarland, USA), or something else (Miracle, Victory, Tin Cup), sports flicks resonate with men. 1. Guys love underdog stories. God does, too. A common theme in sports movies is that an athlete or team that has little chance of succeeding overcomes overwhelming odds to win the big game or event. It’s been overused to the point that it is called the #1 sports movie cliché. And yet, even when we know it’s coming, we play along, rooting for the underdog and cheering when the underdog wins. Rudy has only a slim chance of getting into Notre Dame. With help from a faithful tutor, he gets in. He has no shot of making the football team. He makes the practice squad. Even scholarship players don’t get to dress in uniform for Notre Dame home games. Rudy gets to dress for his final home game. Then, unbelievably, he gets in the game, makes a tackle, and is carried off the field by his teammates. We love underdog stories, primarily because they happen so rarely in our world. But the Bible is full of such stories, even little-known stories such as the one in 2 Chronicles 20, where the men of Judah route a “great multitude”. It’s God’s way of reminding us: when He is on our side, the odds don’t matter. 2. Athletes, like Christ-followers, need to be disciplined. 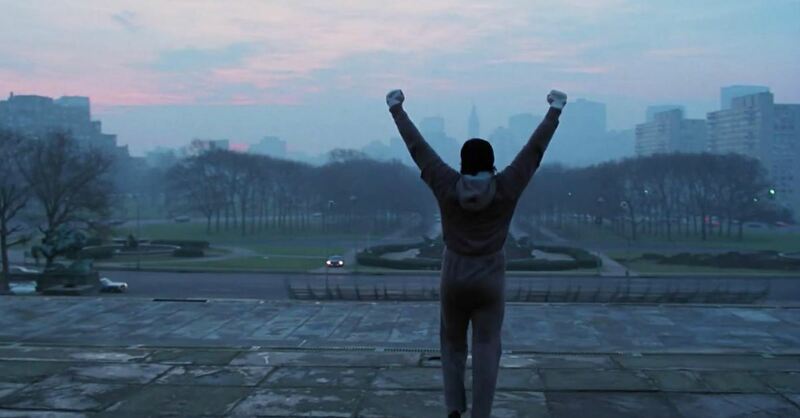 In the original Rocky movie, unknown Philadelphia fighter Rocky Balboa has been selected as the opponent of world heavyweight boxing champion Apollo Creed. With only five weeks to prepare for the fight, Rocky needs an experienced trainer. Enter 76-year-old Mickey Goldmill, who runs the gym where Rocky trains. Getting Rocky ready to fight Apollo appears to be an impossible task. But Mickey trains Rocky as if he were a legitimate contender. He is hard on Rocky but also encouraging. When he uses a technique to improve Rocky’s balance, Mickey says that famous champion Rocky Marciano had the same balance problem and cured it with this technique. As an exhausted Rocky continues to throw punches at the end of a marathon day of training, Mickey buoys Rocky with words of encouragement. Mickey’s training enables Rocky to become the first fighter to go the distance with Apollo Creed: still standing after 15 rounds. God disciplines us because he loves us. Our prize is better than the satisfaction of going the distance in a title bout. It’s a crown of righteousness, placed on our heads by God Himself. 3. Sports stories teach us life lessons. Sports movies are about more than sports. They are stories of people, set against a backdrop of sports. Even if you are not an athlete or a coach, you can identify with some of the people on screen because you have had similar experiences – maybe not on the field or court but in other areas of life. Take Norman Dale, the fictional basketball coach in the movie Hoosiers. Banned from coaching in the college ranks because he struck a player, Dale now is a teacher and coach at tiny Hickory High School in rural southeast Indiana. He barely has enough players for a team, and the best player in the area, Jimmy Chitwood, won’t play. The players bristle at Dale’s regimented approach to coaching and, as the team loses game after game, the basketball-crazed townspeople decide to vote Dale out. Chitwood announces that he will play, but only if Dale stays. The team goes on a winning streak that goes all the way to the state finals, where the team from one of the smallest schools in the state will meet a big-school powerhouse, the defending state champions. Rather than giving them an inspirational speech before the final game, Dale sits with his players and tells them that he loves them. To paraphrase Psalm 119:71, it was good that Dale was afflicted with a lifetime college coaching ban, that he might learn to appreciate the game and those who play it.